Common experience suggests that many networks might possess community structure – division of vertices into groups, with a higher density of edges within groups than between them. Here we describe a new computer algorithm that detects structure of this kind. We apply the algorithm to a number of real-world networks and show that they do indeed possess non-trivial community structure. We suggest a possible explanation for this structure in the mechanism of assortative mixing, which is the preferential association of network vertices with others that are like them in some way. We show by simulation that this mechanism can indeed account for community structure. We also look in detail at one particular example of assortative mixing, namely mixing by vertex degree, in which vertices with similar degree prefer to be connected to one another. 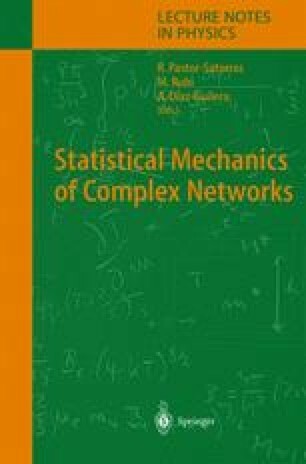 We propose a measure for mixing of this type which we apply to a variety of networks, and also discuss the implications for network structure and the formation of a giant component in assortatively mixed networks.